A small church in Aksum, Ethiopia, claims to have the Ark of the Covenant. It is written in Ethiopia’s ancient book of kings that the son of King Solomon and the Queen of Sheba (Menelik, conceived during a royal one night stand) brought the Ark from Israel. It is now kept at The Chapel of the Tablet at the Church of Our Lady Mary of Zion. Many historians are not convinced about this account of the Ark coming to Aksum. They believe that it is simply propaganda to get people to accept Menelik’s lineage as rulers of the country. Others, including the patriarch of the Ethiopian Orthodox church, Abuna Paulos, disagree. “It’s no claim, it’s the truth,” patriarch Paulos says. “Queen Sheba visited King Solomon in Jerusalem 3,000 years ago, and the son she bore him, Menelik, at age 20 visited Jerusalem, from where he brought the Ark of the Covenant back to Aksum. It’s been in Ethiopia ever since.” And that’s how most of Ethiopia’s Orthodox Christians see it, too. 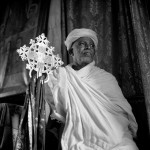 There is a point which is not true- that Ethiopian Orthodox Christians mix some Muslim practices? Christianity was in Ethiopia about 300 years before Islam was even created by Muhammad. Muhammad even mentions his respect for the Ethiopians in the Quran for the way they carry themselves with their Christian faith. So if there seems to be similarity the Ethiopian Orthodox Christianity hasn’t been taking from Islam.